Radio transmitters at every installation in the field rely on network infrastructure for the reliable delivery of alarm signals. This is the reason why RDC has continued to develop and improve network technology over the years. 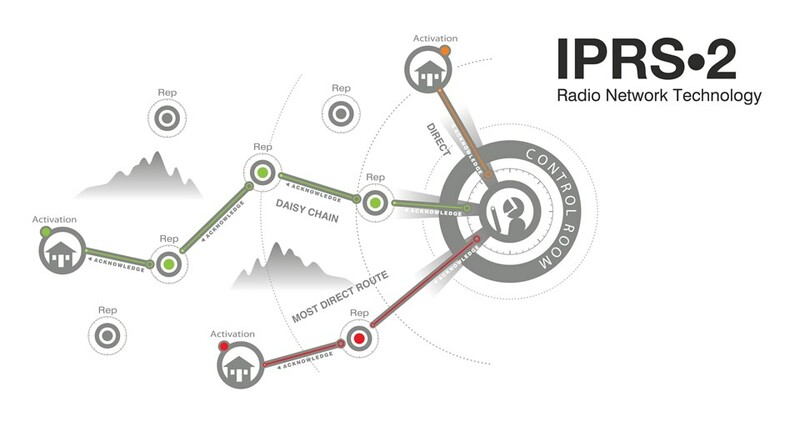 The latest IPRS2 technology is yet another major step ahead, offering far reaching benefits for demanding and ever growing radio networks. Advanced software uses a completely new signal routing technology to send data along the most direct path to the base station. Combined with further airtime reduction and a new protocol philosophy, the system is now more streamlined than ever. This makes RDC's network offering ideal for areas with difficult terrain and for high traffic networks. New self-test features allow for multiple receivers, and other components in the same unit, to be tested and reported individually on an hourly basis. The existing features are of course still available, including intelligent "handshaking" and the "daisy chain" capability. The system supports all existing transmitter models in the field as well as Contact ID transmitters. RDC's D20 base station/repeater units offer the latest radio monitoring technology available. The system was designed to accommodate existing network technology and to add a number of new features. Upgrading from the existing Reporter 8102 system is simple and cost effective. Simply replace Reporter 8102 units with D20 units to take advantage of all the additional features including iprs2. All existing transmitters in the field are compatible, including Contact ID, and do not need to be replaced or upgraded. Existing antennas can be used at the control room and at repeater sites.